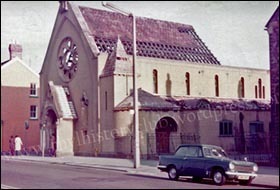 This church was opened in 1975 to replace Rhyl’s original Roman Catholic church, where Roger Casement was baptised. He was knighted in 1911 and hanged for treason in 1916. 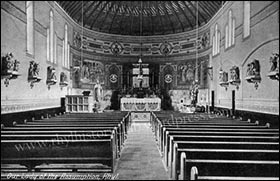 The first Catholic services in Rhyl were conducted in 1851, in a pub whose landlord was Irish. The only worshippers initially were the landlord and his wife and three Irish railwaymen and their families. Rhyl’s Catholic mission was founded by Father Etheridge, rector of St Beuno’s Jesuit College at Tremeirchion. The great Victorian poet Gerard Manley Hopkins lived at St Beuno’s from 1874 to 1877, when he produced some of his finest poetry, while studying to become a priest. The Church of Our Lady of the Assumption – commonly known as St Mary’s – opened in 1863. Roger Casement was baptised there in August 1868, when he was four years old. He grew up in Ireland in an Anglican family. His mother Anne secretly had her children baptised as Catholics while she was holidaying in North Wales without her Anglican husband. Roger Casement worked as a British diplomat and was knighted for his influential reports on the plight of indigenous people in countries colonised by European powers. Disillusioned with the British Empire, he left the civil service in 1911. He went to Germany during the First World War to seek funding, weapons and military expertise for a campaign to end British rule in Ireland. He was arrested in Ireland after a German U-boat put him ashore in 1916. He converted to Catholicism shortly before being hanged for treason in London on 3 August 1916. The original St Mary’s Church suffered structural decay after the Second World War, partly because it was built on, or near, the former course of the river Clwyd. The photo on the left (courtesy of Richard Evans) shows it shortly before demolition. Its final mass was celebrated on 21 December 1975 at midday. At 4pm the same day, the new church – which had been built immediately behind the old one – was consecrated and opened. The new church was designed by Liverpool architects Weightman and Bullen, and built by local company Anwyl. Piles and girders were inserted into the soft ground to provide stable foundations.